I grew up as and continue to be an active member of The Church of Jesus Christ of Latter-Day Saints. My mom, although LDS, was not active and my dad was technically an excommunicated Catholic due to having gotten a divorce in the late 1960s. Anywho, a vast majority of my extended family are Catholic. I have several other religions represented, as well, but this post is about the connection to the Catholic part of my family. I could tell many stories about having this religion represented in my life, but I will keep this post to just a few. Growing up we would go play bingo (and some wonder why I love playing bingo so much?!) at St Therese in Midvale and St Joseph in West Jordan, and even St Francis Xavier in Kearns in our later teen years. Most family events; first communions, marriages and funerals; have taken place at St Therese in Midvale. I also remember attending several bazaars at these same churches. There are a lot of good memories from these events. In Jan 2008, I was listening to the radio and heard breaking news that this church was burning to the ground. I remember being shocked and upset. I immediately texted the info out to my family that knew that church so very well. I later found out that the fire was not as bad as initially reported, but the main church building was a loss. They quickly moved and arranged to hold their mass in the big hall. They still use the hall for mass, at this time. In Apr 2008, I attended two funerals at St Therese. The first was the brother of one of my Uncles. After this funeral, we visited my Tio Robert (dad's brother). We had a good visit. The usual, we visited with Tia Mary inside and went out to find Tio Robert working out back. Bless his heart, he really couldn't hear much anymore, but would just light up when he would see me. I used to make him laugh by telling him that he was grouchy like my dad. Anyway, on this day, he kept telling us to come in and we kept telling him that we had been inside visiting already and had to leave. Well, we lost him a matter of days later. Thus the second funeral at St Therese in just over a week. I bring these funerals up because on 18 Apr 2009, we were invited to attend a mass in memory of Tio Robert. So, my mom and I went up for the service. I remember thinking that I really wanted to focus on what was being said and take in any part of comfort that I would be blessed with, as losing this uncle was hard in that he was one of the last living links to my dad, who I still miss terribly, even after 13 years! Unfortunately, even though I had every intention, I did not make note of the specifics of the sermon, but I do remember thinking that how familiar I was with the Scriptures they were talking about. I am not always on top of when to stand up and the proper respect, I believe, the service deserves. I pretty much just try to follow those that are there and hope that I do ok. I do have to admit that about half way through, I was beginning to wonder what time it was, but couldn't bring myself to look at my cell phone and find out. With this in mind, it seemed that time went on and on and on....we got out to the car and looked at the clock, it had only been an hour. My mom called my sister and let her know that we were done and she commented on how fast it was, I had to laugh and say that it didn't feel like it to me! Now, I must admit here that this feeling of foreverness in a religious service is not exclusive to Catholic services, I have felt the same in services for other religions, including my own. Although, I do not feel it in every religious service I attend! The best thing about going to these types of events is seeing family. I love this part of my family so much. I am so excited to be renewing some relationships and continuing others as we all are showing up and getting closer on social networking sites, like Facebook. Growing up and continuing to be an active member of The Church of Jesus Christ of Latter-Day Saints, I have taken a lot of meanness from some family members, but not this part of my family. This branch has always just loved me and let me be ME! Thank you to all of you, I could never really truly express how much this has and continues to mean to me! 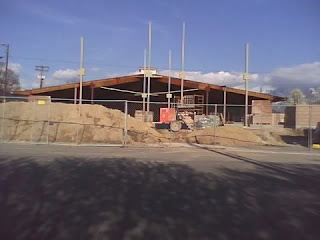 As we arrived at the church, it was wonderful to see that they are finally working on rebuilding and fixing the church building that burned back in Jan 2008. Not only are they fixing it, the are making it even bigger, which I think is long overdue! It was also nice to see them building a better, more formal, doorway to the hall. During the service it sounded like they were getting ready to redo the kitchen in the hall, as well. I was so excited to hear/see all of this and look forward to seeing the end result. I also look forward to many more services in my lifetime for this part of my family. In any case, I am very glad we went to mass in memory of my Tio Robert! Below are a couple of pics I snapped with my cell phone and you can click on the title of this post to see an artists rendition of the new building.